Have you ever noticed how very high end and luxury restaurants always have red walls in their powder rooms and bathrooms? Interesting fact, they do this because red is such a flattering color on pretty much any skin tone, that the owners and designers of these upscale restaurants hope that every time you catch a glimpse of your beautiful self in the mirror, that it will make you want to go back to that restaurant, over and over again! 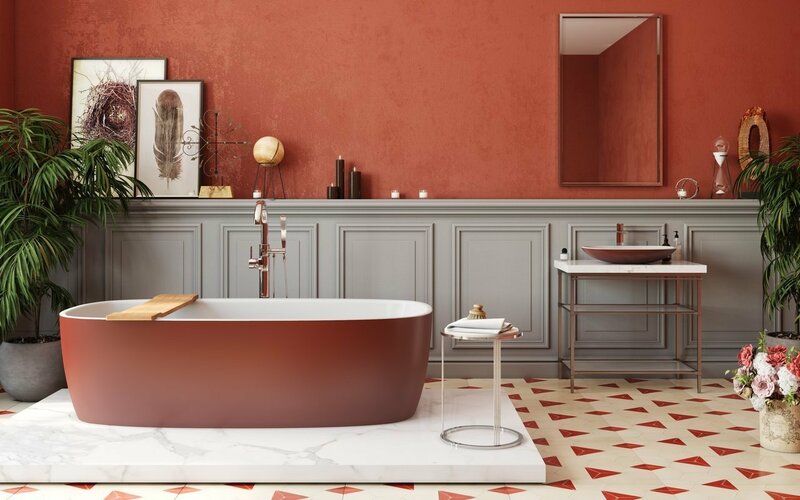 So it’s not at all surprising that so many people want red bathrooms at home too, but red can be a very tricky and difficult color to pull off in a small space, especially if there isn’t a lot of natural lighting. Warm colors do tend to actually advance a space, so even though a red bathroom may feel more closed up and even smaller, it will also feel cozy, warm and sensational. For people who feel like their bathrooms are too sterile and cold looking, adding in an injection of boldly brutal red can actually help in preventing your bathroom from looking too cold and sterile! There are a handful of ravishing red colors to choose from when working with a red bathroom, you can choose to go for a true red, or you could opt for a cooler and more mild shade of red, you could also go for a softer red that has a touch of blue mixed into it, giving it that fuchsia feel, or go for a red that has more orange in it, create a warmer and summery red. We love how this bathroom is mostly white, but with one brick wall painted in a bold red! The freestanding white bathtub looks like it belongs in this entire mix with the white wall décor fixture placed right next to the two long mirrors above the washbasins, it opens the space up even more than it already is. Placing mirrors on the red walls actually helps kill the boldness of the red, ever so slightly as you can see the reflection of the attic windows and the white walls, helping tone the red a little, creating the perfect blend. 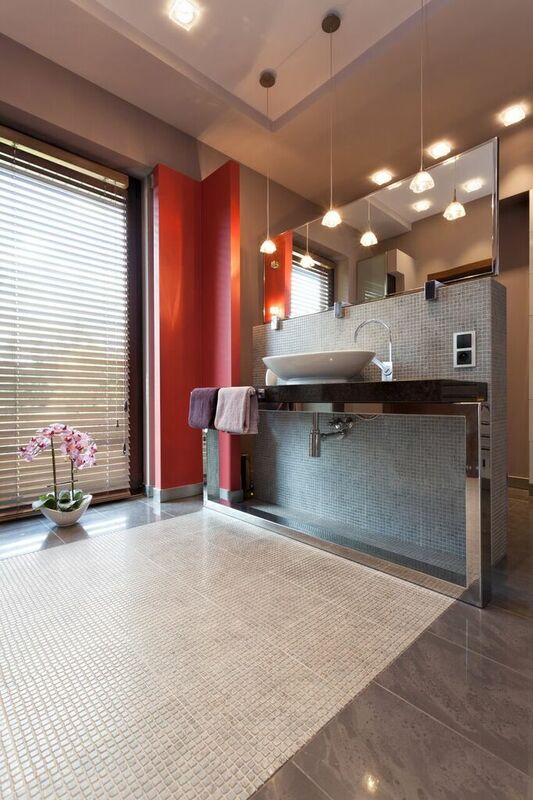 That gorgeously mixed and matched red tone bathroom rug fits this bathroom beautifully too. This bathroom is obviously being primarily used for some epic soaking bath time moments. 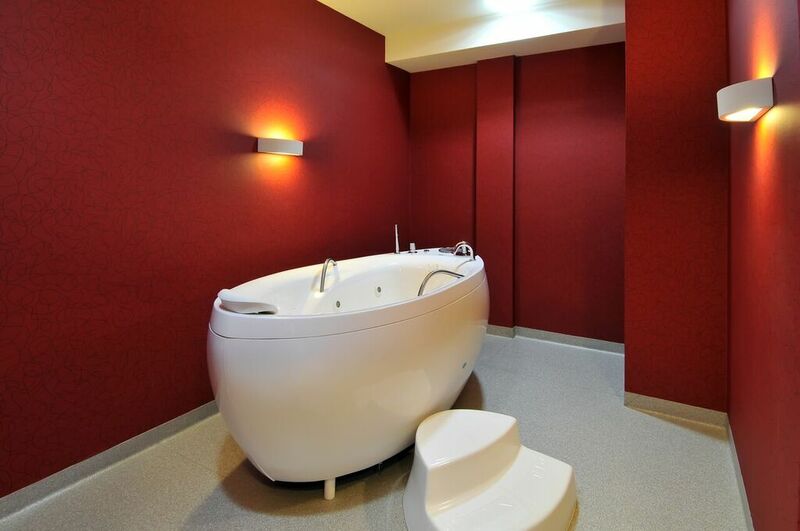 With all the walls in a much warmer and mauve red color, you can see how the white freestanding bathtub, is the center of attention in the room. This is the perfect layout for someone wanting a very bold and warm red bathroom, we love that this red wallpaper also has a very slight, but also a very distinct pattern to it. If you are however looking for a more toned down version of this, we would add some grey or white wall pieces, to tone down the harshness of the red walls, creating a softer, but still bold red bathroom. You could also opt for the same red wallpaper but with a lighter pattern on it instead of the pattern being in a darker red. 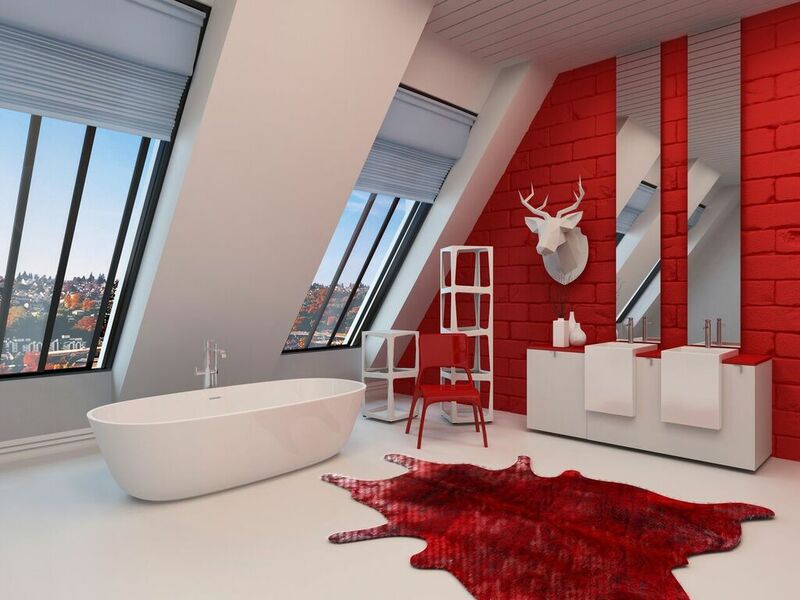 An absolutely fabulous way of bringing red into your bathroom, without it feeling like you’ve painted the bathroom in blood, would be by making the pieces that you would most expect to be white or neutral in color – red! 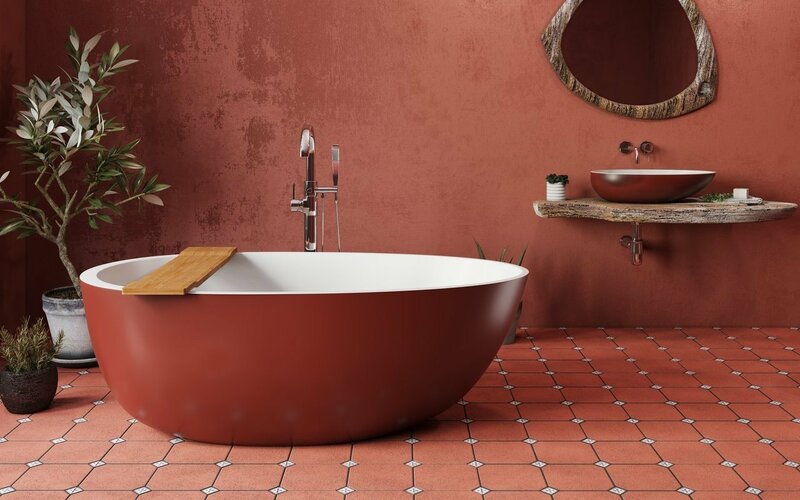 Like this amazing red bathtub, you don’t need to add many more elements of red in a bathroom that has a red freestanding bathtub, because it's already the focal point! 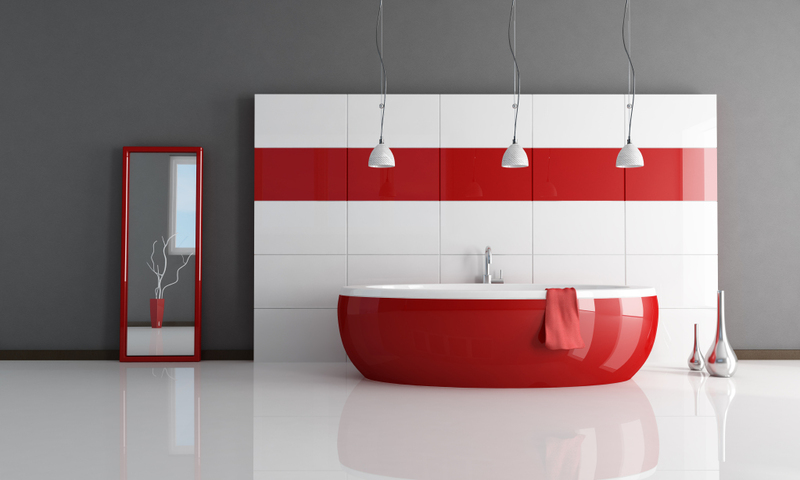 Gray and white are definitely beautiful colors to pair with a red inspired bathroom. Of course, if you really love the idea of having red in your bathroom, but you don’t want to make it the absolute main focus of a bathroom, then add just a sliver of red into a grey and very well lit bathroom. This bathroom has one wall painted in a cooler tone of red, but with the hanging lights fixtures and freestanding washbasins, it actually still adds the warmth and coziness that red just naturally does to a bathroom.